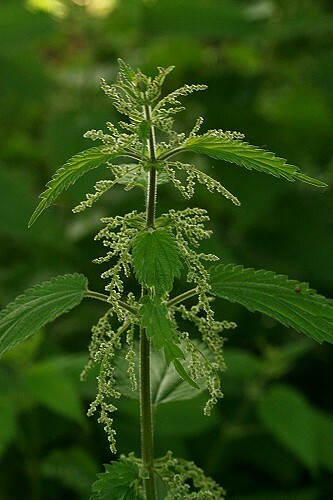 The stinging nettle, sometimes called the common nettle, is indeed common in Britain - on wasteland, road verges and gardens. The stems and the leaves are covered with tiny hairs containing formic acid. If you touch them, the hairs break and release the acid into the skin which can cause a painful, irritating rash. The leaves are serrated and tapered. The flowers are green, have no petals and hang in clusters. The male and female flowers grow on separate plants. Nettles have a lot of uses, both as a vitamin-rich vegetable and for medicinal purposes. The leaves and stems can be used as a tea and the root can be used as a diuretic.